Very creative card with a glittered background. Spotlighting and Unique Background Card. This swing card is pretty easy to mark – hide messages under your front stamped image. 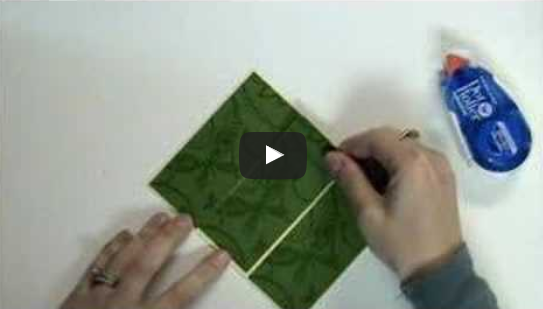 Learn the easy technique of creating an embossed resist background. A gorgeous pink folded card by Sally Traidman. 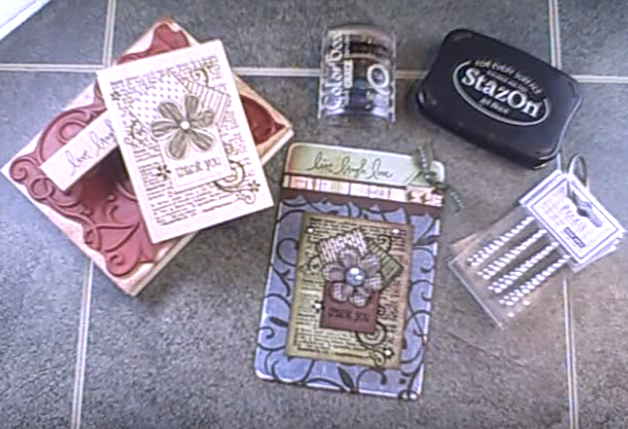 Here is a video showing the manufacturing process for making woodblock stamps. Learn how to do masking with stamping. A gorgeous chipboard card created by Shari. 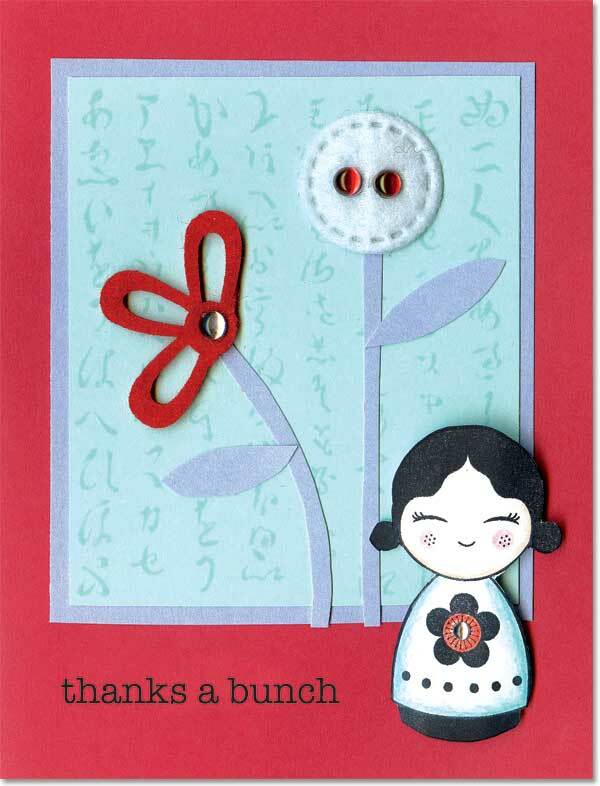 Send a note of thanks with this fun card! Stamp Kanji Poem with Soft Pool ink on a pool rectangle. Layer to hyacinth and then a crimson notecard. 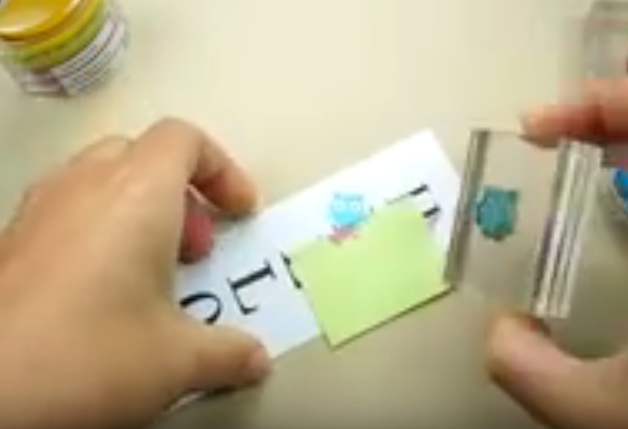 Cut stems and leaves from a hyacinth notecard and glue in place. Trim two petals from a red Summer Felt Flower and adhere in place. Add a white Neutral Felt Button. Color two Smooth Gemstones red with a red permanant marker and add to the white Neutral Felt Button. Stamp doll with black ink on a white cardstock scrap, color with pencils and cut out. 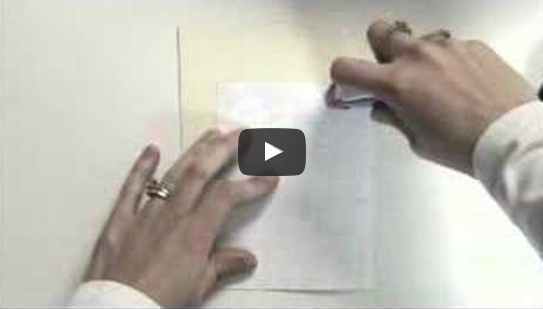 Curve the doll around your finger to add dimension, then adhere with a pop dot. Add a gem. Trim felt flowers with scissors to create new shapes.